PITTSBURGH—Carnegie Mellon University will celebrate the third annual National Robotics Week on April 20 with project demonstrations, lab tours of the Robotics Institute, the annual Mobot (mobile robot) Races and a special lecture by Robotics Professor Howie Choset. 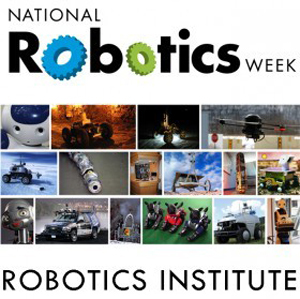 National Robotics Week recognizes robotic technology as a pillar of 21st century American innovation. Events are scheduled nationwide. Rep. Mike Doyle of Pennsylvania’s 14th District, co-chair of the Congressional Caucus on Robotics, introduced the resolution in the House of Representatives in 2010 that established the annual event. Carnegie Mellon’s celebration is timed to coincide with the university’s Spring Carnival. “If Andrew Carnegie were alive today, he would undoubtedly love robots,” said Choset, who will be presenting a view of robotics for the layman. His talk, Robotics 101, will review the wide variety of types and sizes of robots and provide insights into the details necessary to make them work. He will speak at 2 p.m. April 20 in the Rashid Auditorium of CMU’s Gates and Hillman centers. Carnegie Mellon’s Robotics Institute is the largest university-affiliated robotics research group in the world. National Robotics Week provides the campus community and the public with an opportunity to see CMU robots and robot labs firsthand. From noon to 4 p.m., visitors to the Planetary Robotics Lab highbay on the first floor of the Gates and Hillman centers can see demonstrations of Choset’s snake-like robots; of small, low-flying rotorcraft that can map rivers and their environs; of Canine robots that play fetch; and of Calliope, a prototype mobile robot and robot arm used by students in CMU’s cognitive robotics course. Lab tours during that time period will include HERB, the home-exploring robotic butler; Ballbot, a robot that moves atop a bowling-ball-size sphere; the dual-armed PR2 and other robots in the Search-based Planning Lab; a new visualization laboratory now being assembled in Newell-Simon Hall; and two robot soccer labs. Pre-registration is required by April 16. Please visit http://www.ri.cmu.edu/rinrw for more information, updated demonstration and lab listings, and to register. The School of Computer Science will host the 18th annual Mobot Races from noon to 2 p.m. Participants will race small autonomous vehicles through a slalom course on the paved walk outside Doherty and Wean halls.